Technically I'm still grounded (through the weekend) but I managed to sneak in this post for a Simple and Healthy Asparagus Spinach Soup. If you're looking for a rich soup loaded with cream and butter...JUMP SHIP...as this is not the recipe for you! 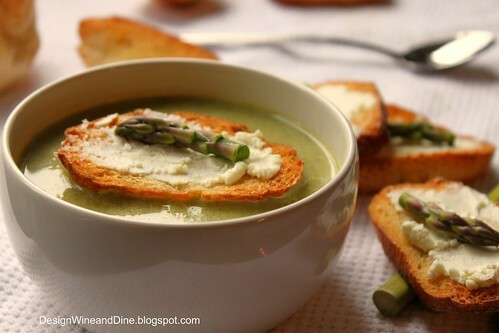 This Asparagus Spinach Soup makes the perfect starter to any spring inspired menu! In a large soup pot with lid, add olive oil and saute up the onion and the garlic over medium-high heat, about 5 minutes. Add the asparagus and spinach and stir well. Continue cooking about 4 minutes. Turn down heat to a simmer, cover pot and cook 25 minutes. Remove from heat, allow soup to cool slightly and blend soup in batches in a blender. Stir in cream, salt and pepper to taste. Do you recall Tiffany from my childhood? 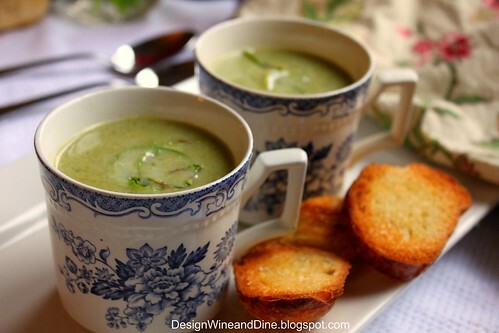 Well, she placed the Asparagus Spinach Soup in dainty little tea cups. While it's cold outside and rainy here today...isn't it nice to imagine you're lunching in the garden?! Great minds think a like....I'm making chickpea and spinach soup as I type. 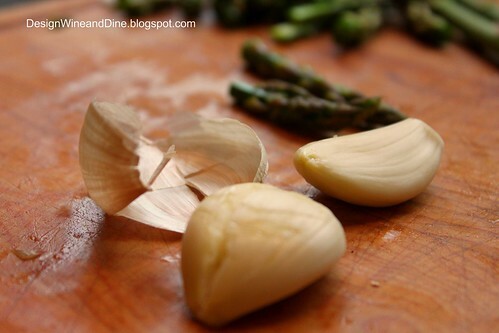 I was planning on making asparagus soup tonight! (Although mine will probably have about 12 times the cream.) This is a great, healthier option. So happy asparagus is in season! Can't wait to see/read YOUR posts! Looks great - and delicious! This looks really good. I love your pics. what a delicious combo love the picts too! I will ask them to keep you grounded a little bit more. It seems that you found the state at which you are very creative, lol. Beautiful soup, I love the color! The soup looks lovely! And I love the little toasts with goat cheese on top... YUM!! oh delicious! this soup looks perfect for spring! 1 large bowl to-go please! So...asparagus is my absolute most favorite spring vegetable. And I've been eating it by the pound. Literally. I think it's time I turn it into some soup! This sounds delicious. It does look like the perfect soup for spring time. It think I might have to take a break from my meal replacements and make this instead. Fish 'n' Chips ~ Have you Heard?